HARTS is an anagram of the work TRASH. Just as we can rearrange the letters in a word we can take another view / perspective of littered items collected from the beaches of Broward County, FL. This image was specifically designed for the cover of the Broward edition of Natural Awakenings: February 2019. 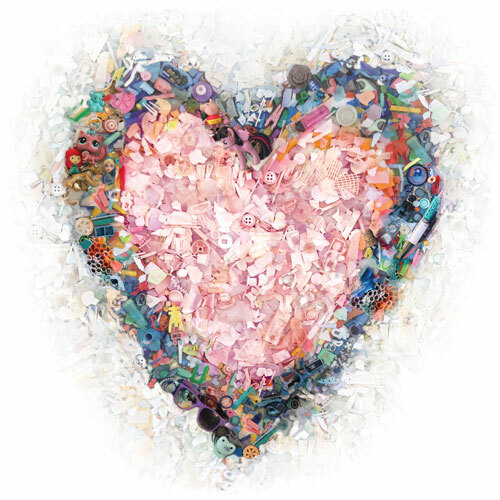 The artist worked from the elements in the original "Heart of Mother Nature", a mixed media, replicating the lighter pieces of plastic, and changing the central heart area to a soft pink color, expressing love and respect. Additional items were added to the heart's border. These small pieces of plastic (and some toys left behind) speak volumns. The fade out of white plastic pieces represent the vast quantity of plastic beyond which we can see, adding to the oceans at a rate of about 12.6 million tons annually (25.6 billion pounds). A great example of upcycling, giving the recovered plastic a higher purpose, raising awareness of self-responsibility. Be the love; inspire solutions. Framed/matted and under glass, 11" x 9", glossy print on paper. check back for pricing (under $200). Now available at Frame 'n Art Gallery, 229A E. Commercial Blvd., Lauderdale by the Sea, Florida 33308. Phone: 954.267.9202. Contact the artist via email SQwood(at)gmail(dot)com or phone 954.630.1610 to purchase this or any of her other artwork. Or, visit Frame 'n Art, Lauderdale by the Sea, FL.